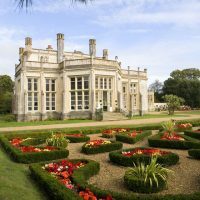 Boasting a rich history stretching back to the 1800’s, Grade 1 Listed Highcliffe Castle provides a magnificent fairy tale setting for weddings, civil and humanist ceremonies. Standing high on the clifftop, the Castle enjoys breathtaking panoramas of the raw beauty of the surrounding Dorset coastline. Set within 14 acres of idyllic parkland and Capability Brown landscaped gardens, Highcliffe provides a regal backdrop to your memorable day. Hosting only 50 weddings a year adds to the exclusivity of this majestic venue. Whether you prefer a small intimate gathering or a grand celebration, the dedicated wedding team can help you realise your vision. Accommodating up to 100 guests the Wintergarden benefits from full-length windows, which wash the elegant room in natural light. The elegance of the room is enhanced by the natural décor, high ceiling and sensational views over the grounds. Accompanied by a baby grand piano and fresh floral arrangements, the Wintergarden makes a delightful setting for your ceremony and photographs. This impressive space offers a fusion of rustic grandiose. It also sits adjacent to the Castle bar where drinks are served from 5pm. This is the perfect location for a dancefloor made up to your own specification. This Stately Dining Room caters for up to 80 seated guests or 150 reception guests. 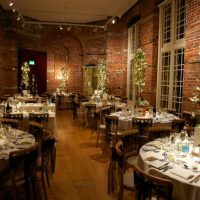 Exposed brick walls and full-length windows looking out toward the Isle of Wight Needles, make this a charming setting for your wedding breakfast. 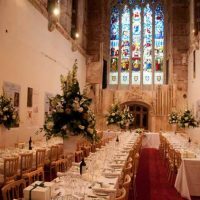 TheGreat Hall is the largest space in the castle and is ideal for extravagant celebrations. Catering for up to 110 diners and 200 reception guests, it is the showpiece of Highcliffe Castle. 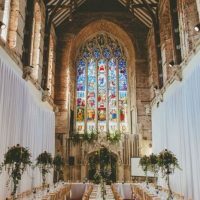 The 30ft high stained glass Jessie window, and high vaulted ceiling, transport guests back to a time of romanticism and opulence. Following its refurbishment, it now benefits from underfloor heating and subtle warm lighting. no matter what your tastes, you will find something to suit your budget and preferences. Dependant on a small corkage fee, you are welcome to provide your own drinks for the occasion (excluding beer, lager, cider or spirits). The corkage fee covers receipt and storage of your drinks, refrigeration if required, glassware and service and handling the empties. If you are looking for a fuss-free option, you can also purchase drinks through the castle. To discuss your needs please call 01425 278807.